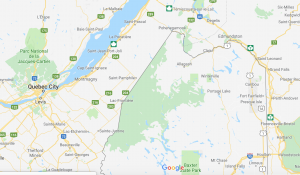 People in Allagash, Maine (population 236) are unimpressed that a new movie named after the town is set to be shot in the far-off western portion of the state. The real Allagash, at the end of Route 161 before a dirt road goes into the North Woods, is on the Canadian border in northwest Maine, so far up that it’s north of Quebec City. At the confluence of the St. John River and the Allagash River, the town mostly consists of people of Irish, Scottish, and Acadian descent. It has captured the imagination of marketers, who have attached the name to canoes, boots, belts, and beverages, even though there’s no local connection to them. But the movie? Local folks don’t see how a fictional-story motion picture can capture the essence of the real town where it’s supposed to take place without actually being shot there, according to the Bangor Daily News. The non-Allagash Allagash movie is at the end of a long trail of indignities local residents have suffered, including when the owner of the town’s only restaurant is occasionally asked by visitors to serve Allagash beer.